This article is about enemies that appear in single-player modes. For teams consisting of specialized fighters, see Enemy team. Some enemies in the Subspace Emissary. Enemies are a gameplay element found in Super Smash Bros. Melee , Super Smash Bros. Brawl, and Super Smash Bros. 4. Generally associated with single player modes, they take on the form of specialized characters that can autonomously move on their own, and potentially attack players. They are sometimes called Mobs. Enemies made their debut in Melee, primarily acting as obstacles in the game's new Adventure Mode. Throughout the Adventure Mode, a number of different enemies based on different game series appear in some levels, requiring the player to fight through them to continue through the stage. As enemies can deal knockback and damage to players, they grow more powerful the higher the difficulty is. When defeated, enemies can rarely spawn trophies. Enemies can be defeated by either dealing enough damage to them or knocking them off the stage. Certain attacks also defeat them instantly, such as Kirby's Inhale. Enemies can be grabbed and carried as though they were heavy items, and they can be thrown like such items for heavy damage and knockback; holding onto an enemy for too long, however, will cause them to escape the character's grasp and directly damage them. Unusually, enemies can spawn out of Crates, Barrels, Capsules, and Party Balls at any time in the game, though their spawn rate is extremely low. As regular melees do not have a difficulty setting, the power of these enemies stays constant; in general, larger enemies deal more damage when they hit opponents, as well as inflict significantly more knockback when they are thrown. All enemies in the game grant a bonus when they are KOed. Individual bonuses can be rewarded multiple times, which is important in the scoring for Adventure Mode. The role of enemies was expanded on in Brawl's Subspace Emissary mode, where every level contains at least some enemies. 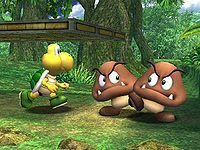 A large number of enemies, both original to the series and from other games, appeared in Brawl. A complete list can be found here. Enemies were changed between Melee and Brawl. Enemies are now considered their own class, rather than highly specialized items; as a result, they are instead grabbed and thrown like characters, and they now have unique behavior when they are defeated. Within the SSE, all enemies are also given an HP bar which the player can view whenever they deal damage to an enemy. Enemies can also no longer spawn from crates or barrels in any mode. A wide variety of enemies appear as part of Smash Run, with many coming from numerous series outside of Smash 4, though some of Brawl's Subspace Army did return. A full list of Smash Run enemies can be found here. Between Brawl and Smash 4, a number of enemies cannot flinch in response to the player's attacks, and some also have resistance to grabs. Players are also no longer given their remaining HP, and are only given a unique overlay that appear on weakened enemies as an indicator to how much HP they have left. Enemies can only appear on Master Core's Master Fortress form, as among the many obstacles players have to bypass in order to clear the stage. Only four enemies are present in the game: Stalfos, Geemer, Lethinium, and Plasma Wisp, and all four are given a unique shadow filter to alter their appearance. This page was last edited on November 30, 2018, at 09:23.